Homer Simpson is a party animal who spends his life being only one Duff beer away from total disaster. He wants to have as much fun as possible regardless of what a bad idea it might be. Homer's heart is always in the right place, but unfortunately the same can't be said for his brain and mouth, resulting in a lot of mess for Marge to clean up and a lot of lecturing for Lisa to do. He loves nothing better than throwing a party, especially if it involves copious amounts of beer and pork products, but his lack of organizational skills invariably lead to mayhem, lawsuits and several injured guests. What Homer needs is a bit of outside assistance to ensure everything runs smoothly on the big day. Homer's antics have ticked a lot of people off over the years, some of whom have even built up a hatred of him. These are not the sort of people Homer would want in his garden drinking his beer and eating his food. Homer also has a severe aversion to many people in his life, not least of which include his malicious sisters-in-law Patty and Selma (or as he calls them the Gruesome Twosome) and of course his irritatingly cheerful next door neighbour, Flanders. Homer wouldn't want his day to be ruined by people who hate him trying to bump him off, or people he can't stand raining on his parade. It would be advisable for Homer to employ some bouncers to ensure no unwelcome guests slip through the net. The local mob boss Fat Tony would no doubt be happy to hire out a few of his goons for the day in exchange for Homer carrying out a couple of favours for him. They would keep Homer's enemies away from the festivities, (perhaps permanently) leaving him free to relax and gorge himself in peace. It is the introduction of alcohol into the proceedings that is always Homer's undoing. As he says himself, 'It is the cause of and solution to all of life's problems' and for Homer, this is definitely one of life's maxims. His beloved Duff beer has in the past made him do all manner of weird and not so wonderful things, from leering at Maude Flanders to marrying a lady of ill repute in Las Vegas. Homer needs Mo the bartender there to ensure the booze flows at a steady pace. Mo is highly experienced in keeping Homer tipsy without letting him go too far and his skills will also come in very handy in fending off Barney when he attempts to steal a couple of kegs for himself. Homer's first attempt at fulfilling his dream of having an entire hog roast did not exactly go according to plan. The pig ended up taking an aerial trip across Springfield and after all that Lisa still refused to renounce her vegetarianism. Cooking a whole pig properly is not something that should be attempted by the inexperienced barbecue chef, especially when they are recklessly brandishing a beer in one hand and a can of lighter fluid in the other. Homer needs to hire in some professionals who specialise in traditional fare and are willing to cook at the location, wherever people want their hog roast. By being sensible in the planning stages for once, Homer will be able to throw a great party and if he gets too drunk to remember that he's the one hosting it, he will avoid disaster by having the professionals on hand and everyone will go away happy, well-fed and safe. Jasmin Blunt is a writer who believes that we can learn a lot from Homer Simpson’s antics when it comes to organising a Barbecue for the first time. 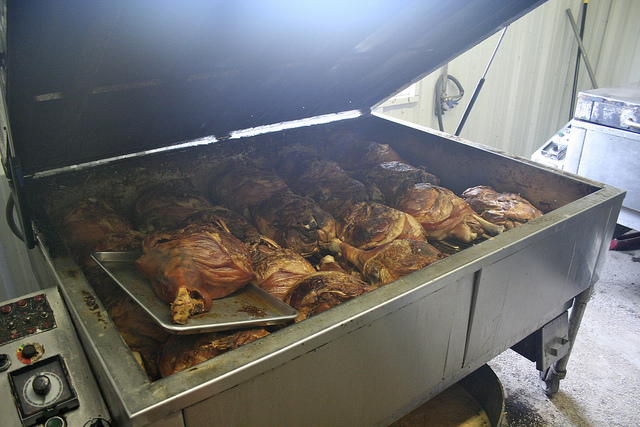 When looking for help to organise hog roasts, York experts recommend finding a specialist who can assist and supply you with everything you need.